Knicks Go (Paynter) wins the Claiborne Breeders' Futurity (G1) at Keeneland on 10.06.2018. Albin Jimenez up, Ben Colebrook trainer, KRA Stud Far owner. 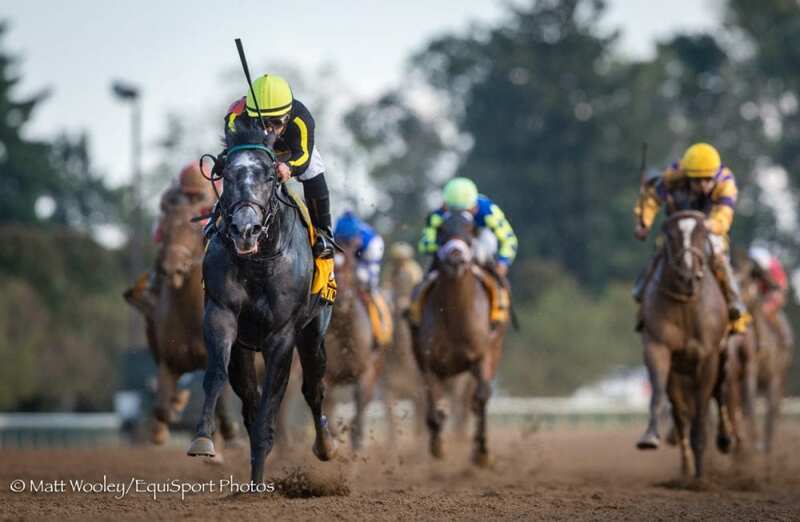 Breeders' Cup Juvenile runner-up Knicks Go will kick off his 2019 season in Saturday's G3 Sam F. Davis Stakes at Tampa Bay Downs, while Sunday's top sophomore contest is the G2 San Vicente at Santa Anita Park, featuring Bob Baffert pair Coliseum and Dessman. Only the Davis features points on the Road to the Kentucky Derby, but the seven-furlong San Vicente is often used as a jumping-off point for 3-year-olds with Derby potential. Don't forget about Saturday's mandatory payout of the Rainbow 6 at Gulfstream Park, in which the total pool is projected to reach $10 million. This entry was posted in Weekend Lineup and tagged coliseum, dessman, Gulfstream, Horse Racing, knicks go, road to the kentucky derby, sam davis, San Vicente, santa anita, tampa bay, weekend lineup by Paulick Report Staff. Bookmark the permalink.